TopLiner Booster Contours are designed as flow-through pads that fill to capacity then pass additional fluid to the primary undergarment economically extending the use of any disposable brief or undergarment. They improve wearing comfort by ending leakage, rashes, and nighttime changes. Easy to change and dispose. 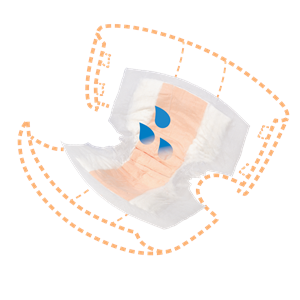 The TopLiner Booster Contours have a wider design to help contain bowel incontinence. The soft texture makes clean up easier. Latex-free. Pad dimensions are 21.5" x 13.5". Capacity of up to 13.6 oz fluid. Sold by the package; 12 pads per bag.